Central Texas Birth Center is different. We believe in traditional, ancestral midwifery care; and we believe it keeping it as financially accessible as possible. We believe in a relaxed, natural approach to prenatal care and birth. We believe that the trusting relationship formed between midwife and mother is the hallmark of midwifery care. The difference can be felt from our first meeting. Our initial consultation (free of charge) begins with a simple form, in person. After that, one of our caring midwifery students will give you a tour of our facilities and answer any questions that may come up during the tour. Then you’ll sit down and chat with one of our Licensed Midwives where you can explore any questions or concerns you may have about planning a natural birth outside the hospital. Central Texas Birth Center does not rely on call schedules for midwifery care. Traditional midwifery means you have the right to know who will attend your birth. This alone is the reason many families choose midwifery care in the first place! You will have the chance to meet each midwife through your prenatal care. The midwife that you feel most comfortable with is the midwife you will call in labor. In fact, usually when a family has met everyone and chosen their midwife, they elect to have their remaining prenatal appointments solely with that midwife. This builds the midwife/family relationship and is strongly encouraged. During your birth, our approach is personalized to each individual family. Just like your fingerprint, your birth and birth wishes are unique and we want you to feel free to communicate those wishes. Due to the fact that we keep our volume low (10-15 births per month), we are afforded the time and patience to indulge with you towards the birth of your dreams. 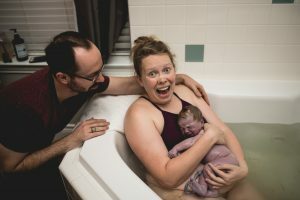 We offer waterbirth if you desire, and towards that end we have generously sized tubs at the birth center or inflatable tubs for homebirth that we lend to our families free of charge. Our midwives encourage eating and drinking during labor, and movement to your comfort. We utilize essential oils, rebozo techniques, position changes, massage, and even call on chiropractic care to assist you in your birth journey. Occasionally, the factors surrounding a birth fall outside the realm of normal and it becomes necessary to move your birth to a hospital setting. In this case, your midwife will remain with as a support person until your baby is born. Furthermore, your midwife will visit you in the hospital the next day and after you are discharged from the hospital she will continue the regular schedule of postpartum care. Caring for families through the postpartum period is very important to the midwives at Central Texas Birth Center. Whether you birth in the center or at home, your midwife will visit you at your home 48-72 hours after your birth. During this visit, we not only assess the physical health of mom and baby, but we also inquire how you’re feeling emotionally. Do you have enough support? Are there resources we can help you with? The postpartum period can feel like a lonely time for a new mother, and our goal is to support your needs, whatever they may be. Postpartum care continues with visits at the birth center 2 weeks and 6 weeks after your birth. However, if you feel that you need a visit sooner than that (or an extra visit) we’ll happily arrange one…at no additional cost. 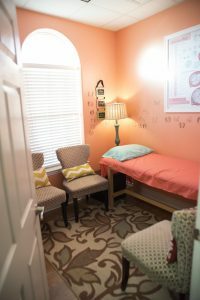 Central Texas Birth Center strives to be more than just a beautiful facility where babies are born. We, the midwives and staff, want every woman and family to feel fully supported and loved through their entire experience here. Every one of us feels called to this work and it shows in our care. The fee for services at Central Texas Birth Center is $3900. This includes full prenatal care, routine lab work, birth center or homebirth, and postpartum care for mom and baby through 6 weeks. This fee does not include ultrasound, which is only required in medical necessity. We accept payments. We collect $400 at your first prenatal visit, and the remainder is due by 36 weeks, whether you chose to pay monthly or in one lump sum at the end. We give a discount if you pay in full when you start care. This reduces the full fee to $3600. We do not file with traditional insurance companies, but we will help you file yourself for reimbursement. We have worked with non-traditional health sharing accounts (i.e. medishare, Samaritan ministries, etc) with decent success. We do not accept Medicaid, but we offer a significant discount for those families. Please ask. I love you so much. I remember all of these feelings from the very first time we stepped through the door. CTBC is home. I came to ctbc, because I was tired of being a chart number. I was surrounded with love, and empowered to birth the way I wanted. They are not just a rypucal birthing center They are family! It feels so natural…like home in the birth Centers amazing atmosphere created by the birth staff…I cannot express how grateful I am to have experienced TWO of my three babies with them. 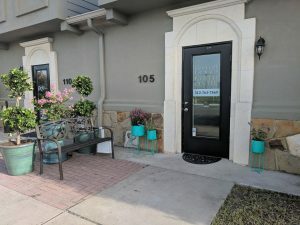 I will always have every baby with them…I am a birth doula and have seen what it had the potential to be like and what they create and HANDS DOWN central texas birthing center takes the cake. They changed my life, and I fell deeper in love with my life and my husband because of them!